As a pinnacle in the church year, some might get the feeling that it’s all downhill from Easter. But perhaps Pastor Paul Strozier of Madison Park Church of God in Anderson, Indiana, said it best last year in an article he wrote: “The baskets have returned to the attic, the plastic eggs are being recycled, somewhere in the house there is at least one purple Peep left unconsumed—at least until the toddler finds it…But can we really let the celebration of the resurrection of Jesus Christ wait a whole year to be acknowledged and celebrated again? Easter never ends for the follower of Jesus Christ…Imagine how it might change our homes, our families, and our communities if we lived every day with resurrection power, hope, and joy.” For Church of God congregations across the country, Easter has only just begun! Here’s a look at how churches observed Easter week. The ordinance of footwashing is commonly practiced in Church of God congregations, and Harvest Point Church of God in Lordstown, Ohio, was no exception. There was one notable difference, however. Harvest Point came together with York Avenue Church of God and Eastside Church of God of Warren, Ohio, for a unity Maundy Thursday service. 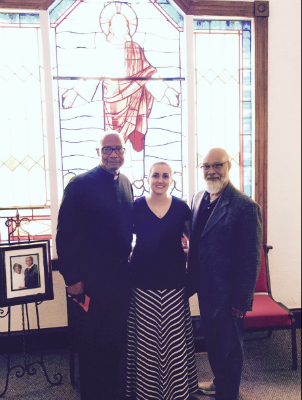 Though it wasn’t the first unity service between the three congregations and others in the surrounding area, it was a unique opportunity for multicultural, multiethnic footwashing. “Our church is 100-percent white, York is 100-percent black, and Eastside is very diverse,” Pastor Shannon New Spangler explains. “We definitely want to have a purposeful unity.” Jesus is the subject, and that’s all that mattered. Now the churches are in discussion about how to increase the regularity of working together for the kingdom. Maundy Thursday at First Church of God in Inverness, Florida, was also memorable, but for a very different reason. The church once again hosted a drama-filled Lord’s Supper experience for the church and community that few could ever forget. 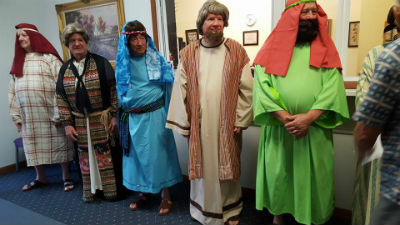 Actors dressed up in full costume and makeup to vividly portray the events that unfolded in the Upper Room. Creativity abounds in this Florida church, as it does at numerous other churches across the country that also incorporated drama into their Easter weekend activities. It was delicious food that many in the city of Defiance, Ohio, will remember about the Easter events of the First Church of God congregation in that community. While Thanksgiving and Christmas dinners are common outreach events in many parts of the country, Easter isn’t always associated with community dinners. But, why not? After all, Easter is the seminal Christian holiday. First Church of God in Defiance, Ohio, invited the community to a free Easter turkey dinner with all the usual trimmings, plus various activities and treats for children. Jesus was again the subject on Saturday and the entire weekend at First Church. In Anderson, Indiana, the classic Easter egg hunt and community festival also became an outreach to special-needs families. Following the traditional egg hunt at Main Street Church of God, a hunt geared toward those with a variety of special needs ministered also to family and friends. Jennifer Crum, associate pastor of children and family ministries, explains: “When we were advertising the egg hunt on Facebook, a couple of different families inquired about whether or not we would have a special area for individuals with special needs. I felt like this was an area that Main Street could step up and take some initiative, even on short notice. We set aside 150 eggs and planned a second hunt, after the first, to allow time to set up eggs on picnic tables in the shelter, and get small children, who could be tripping hazards for some, out of the way.” Pastor Jennifer looks forward to the chance to expand such ministry opportunities. Photo: Campton First Church volunteers carrying the cross. 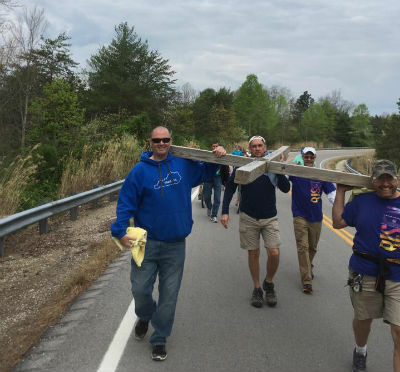 Also on Saturday, Campton First Church of God in Campton, Kentucky, participated again this year in the annual carrying of the cross from one end of the county to the other. Multiple churches volunteer for portions of the journey as they publicly demonstrate the true meaning of Easter. Campton First Church volunteers showed up for the roughly 2.5-mile evangelistic journey, which also prepared their hearts for the celebration that would commence in the morning. You are making a difference, Church of God. May the resurrection power and fervor continue all year long. This entry was posted in All Church of God and tagged Anderson, baptisms, Bellingham, Campton, carrying the cross, Communion, community, Cornwall Church, Defiance, dinner, donations, drama, Easter, egg hunt, evangelistic, First Church of God, FL, Florida, foot washing, footwashing, Giving, handicap, Harvest Point Church of God, IN, Indiana, Inverness, Jennifer Crum, Kentucky, KY, Lord's Supper, Lordstown, Madison Park Church of God, Main Street Church of God, Maundy Thursday, multicultural, OH, Ohio, outreach, Paul Strozier, Resurrection Sunday, salvation, saved, Shannon New-Spangler, special needs, unity service, WA, Washington. Bookmark the permalink.